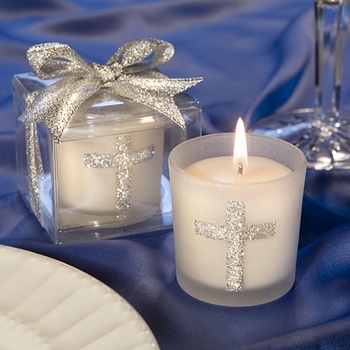 The understated elegance of these Sparkling Cross Candle favors makes them ideal for Christenings, Baptisms, first communion or any special religious celebration! They are great for decorating tables or giving out to your family and guests as a special memento of your blessed event. Each candle comes poured into a frosted glass holder that measures 1 3/4 inches wide by 2 inches tall and enhanced with a glistening silver cross across the side. Each is then presented in a clear acetate gift box and graced with a silver sparkle ribbon tied into a bow. Minimum order is 30 with free shipping. You also have the option to add Personalized Tags or Stickers with your order ($.35 each favor) and design your own personal message to each recipient you present these to!